It’s a known fact that home loans have made buying home a simplified task. Banks and Financial institutions offer myriads of home loan products that have made the dream of buying home come true. Axis Bank is one the popular choices when it comes to availing home loan. The Axis bank offers its customers an array of banking solutions and Axis Bank home loan is one of them. In fact, Axis bank offers different types of home loans. Based upon your requirement, you can choose the one that you want. Why should you choose Axis Bank as your home loan provider? When it comes to choosing a bank for home loan, there are various factors that one must take into consideration like the interest rate offered by the bank, the loan application and approval process, whether there are any pre-payment closure charges, how much time does it take for loan processing, does the bank offers the balance transfer facility and much more. Taking all these parameters into consideration, Axis Bank emerges as a popular choice. Axis Bank is a renowned bank that offers the home loan as one of the banking solutions to its customers. 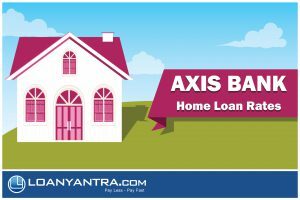 Home loan by Axis Bank is easy to access and avail. The bank offers home loan to salaried individuals who are employed with Government or working in the organization of repute. It also offers home loan to professionals like architects, doctors, dentists, cost accountants etc. Self-employed individuals can also take home loan from Axis Bank. Taking the home loan from Axis Bank would require to fulfil certain eligibility criteria. The bank has defined certain parameter which the individual must match if they want to take the home loan. Identity Proof- You can submit either passport, Adhaar card, Driving Licence, Pan Card, Voter ID. Address Proof- Axis bank accepts the following as your address proof, ration card, Adhaar card, Passport, voter ID, Utility bills like electricity bill, gas connection, telephone bill. Proof of Income- The Salaried individuals needs to submit the salary statement of the last 3 months, Form 16. In case of self-employed individuals, one needs to submit the ITR of last two years, last two years’ income computation certified by a CA. The bank doesn’t require a guarantor. CIBIL Score- One of the key factors that influence your home loan approval from the bank is your credit score or CIBIL score. It is a measure of your financial health and how good you have been in repaying the loans. Based on this score the bank approves your loan. Well, the credit score may vary from bank to bank but its advisable to maintain a good credit score to ensure that there is no hassle while home loan application processing. Axis Bank demands the CIBIL score between 650-750. Switching Fees (Fixed Rate to Floating Rate) – 2% on the outstanding principal amount. How does Axis Bank calculate home loan? The FOIR or Fixed Obligation to Income Ratio is an important parameter which the Axis Bank uses to determine home loan eligibility. The bank takes into account all the fixed obligations like current EMIs, rent etc. and based on it, the bank calculates your eligibility. Axis Bank has kept the minimum FOIR:0.65. Loan Tenure – 30 years You can avail this loan to buy home which is under construction or resale house or plot or for self-construction. Does Axis Bank levy the prepayment charges on floating and fixed interest rate? No, the prepayment charges are levied only on fixed interest rate. Can the home loan be used for renovation and extension of home? Yes, you can use the home loan for repair, renovation, improvement and extension of the home. What is the late EMI payment charges levied by Axis Bank ? The charges of the EMI late payment fees which are 2% per month on the outstanding monthly EMI. What is Asha Home Loan? It is a loan for customers who are buying the home for the first time. It is tailored the home loan for the first time buyers and comes at an attractive interest rate. Asha Home Loan can be used for which purpose? You can avail this home loan for buying a ready-made home, property under construction, self-constructed house or buy a plot using the Asha Home Loan by Axis Bank. Can I get Asha Home Loan under fixed interest rate? No, the Asha Home Loan is available only under fixed interest rate. What is the maximum home loan amount under Asha Home Loan? Asha Home Loan grants the maximum loan up to Rs. 28 lac if the property is located in the area with the population more than 10 lac and Rs. 20 lac if the property is located in an area where the population is up to Rs. 10 lac. Is there any processing fees that the borrower needs to pay while applying for Asha Home Loan? Yes, the applicant needs to pay the processing fees of 1% on the outstanding principal amount with a minimum of Rs. 10,000 plus the GST. Can anyone apply for the empower home loan? Salaried individuals cannot apply for empowering home loan. It is only for resident self-employed people. What all-purpose can be solved using the Empower Home Loan? With Empower Home Loan you can buy a ready-made home, property under construction, self-constructed house or buy a plot, you can also use this loan for home improvement and extension. Can I avail Empower Home Loan under fixed interest rate? No, the Empower Home Loan is available only under the floating rate of interest. Can an NRI avail the Empower Home Loan? No, only the self-employed resident of India can avail the Empower Home Loan. What all-purpose can be solved using the Fast Forward Home Loan? Can I avail Fast Forward Home Loan under fixed interest rate? No, it is available only under the floating rate of interest. Can the Fast Forward Home Loan be clubbed with a subvention scheme or any other scheme offered by the builder? No, you cannot club the subvention scheme with the Fast Forward Home Loan. Can I make part prepayment under the Fast Forward Home Loan? Yes, you can do the same. But first, your loan must be live with us for a minimum of 120 months from the time loan was disbursed. In case I want to increase my EMIs under the Fast Forward Home loan, can I do so? Yes, you can do the same but, it will disqualify the loan from the EMI waiver benefit offered under this scheme. What all-purposes can be solved using the Shubh Arambh Home Loan? I have completed 48 months from the date of the first-month disbursement. Now only 4 EMIs are left, will I get the benefit of this scheme? If the residual EMIs is less than 4 then the residual tenure will be waived off but no other dues should be pending. What is the interest rate offered by Super Saver Home Loan? This home loan is available at 10.25%. What all-purpose can be solved using the Super Saver Home Loan? With Super Saver Home Loan you can buy a ready-made home, property under construction, self-constructed house or buy a plot, you can also use this loan for home improvement and extension. Can I avail Super Saver Home Loan under fixed interest rate? Is there any processing fees that the borrower needs to pay while applying for Super Saver Home Loan? Why choose Loanyantra as your helping partner? If you are looking for a platform which can help you in deciding the right place for applying for home loan, then Loanyantra will offer all the necessary help. Our portal gives you an access to all the information related to banks and financial institutions offering the home loan. Whether its home loan interest rate, eligibility check, paperwork, calculation of EMI or anything related to the home loan, you can get access to all this on Loanyantra. Moreover, you can easily compare the home loan rates of different banks and interest rates. There are no extra fees that we charge, we also believe in rendering hassle-free home loan processing. Moreover, with us, you don’t have to worry about your information security. Loanyantra believes in providing complete security of data, we do not share your information with the third party. Also, we are the one-stop solution for everything related to home loan and home loan assistance. For more information, contact us today and let us help you buy your dream home.